I think Fifi is either gonna love this outfit, or she’s gonna kill me for dressin’ her like bo-peep on crack. I don’t see many people dressin’ their SD13’s quite so frilly. I wish there was something I could do to make it just a little bit evil. Please comment if you have any hot tips! 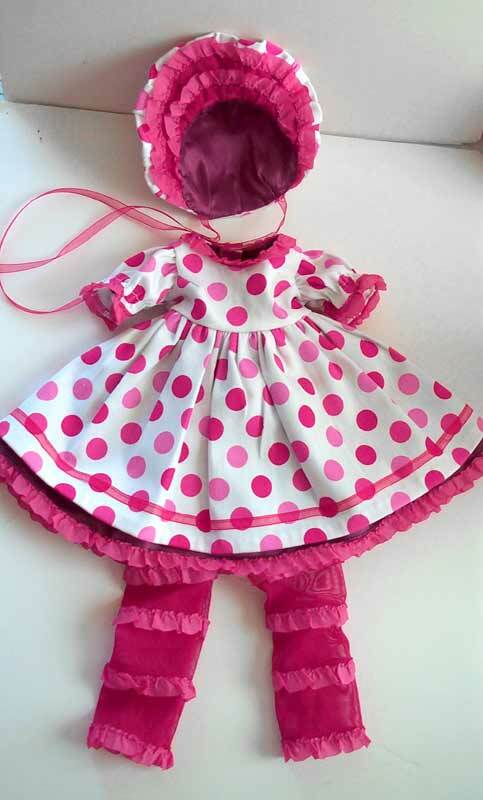 In any case, this is the Dolly Dolly Alice dress pattern, altered a bit. Thank you to Helene for traveling this road before us! I empire’d the waist by shortening it 1/2″ and scooped the neck out a bit, I thought that might give it *just* the decollete the outfit needed to age it a little (snicker). It is fully lined, and I hid most of my grevious mistakes pretty well. The one thing is the fabric is way too heavy. But who could resist this Baskin Robbins pattern!?!?! But it made the sleeves hard to gather, so they might not be tight enough. The bonnet I got from an old victorian dolly pattern and enlarged it. Eeee! I like the outfit, but I’m personally not a bonnet fan. Other than the *shudder* bonnet, it’s lovely! Bonnets must be used sparingly! I’m going to make her some little devil horns. With or without the bonnet, that should spice it up a bit! ha! we were thinking of a shephards crook (like bo peep) but red with a devils tail-like crook. eh?